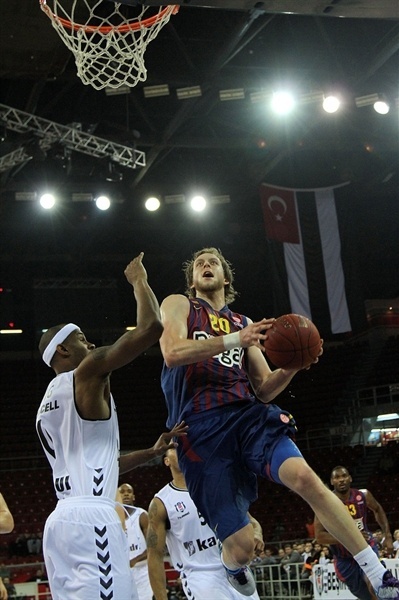 FC Barcelona Regal broke open a close game by dominating the fourth quarter to beat Besiktas JK Istanbul 59-73 on the road Thursday. The Spanish champs held Besiktas scoreless for the first five minutes of the fourth quarter to crack open what had been a close game. Barca improved to 3-1 in Group F and registered its first road win, while Besiktas dropped to 0-4. It was also the third win for Barcelona in as many games against Besiktas this season. 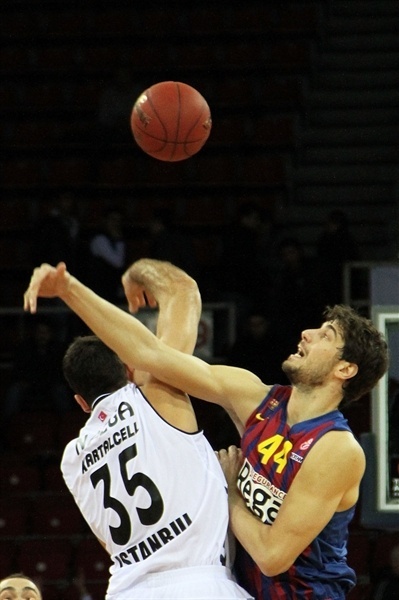 Gasper Vidmar dominated early to keep Besiktas alive. When the hosts got going, they matched Barcelona basket for basket, but that all came to an end in the fourth. 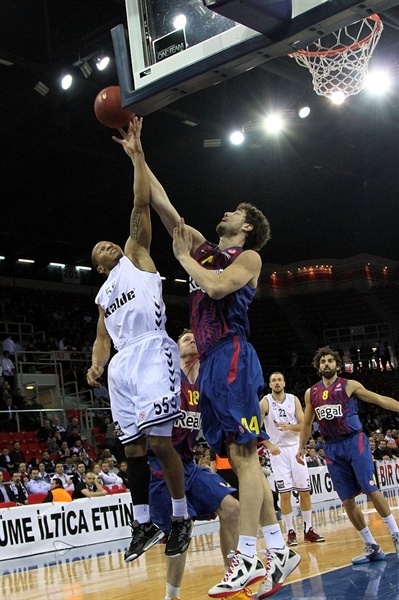 Ante Tomic paced Barcelona with 15 points of 7-of-8 shooting. 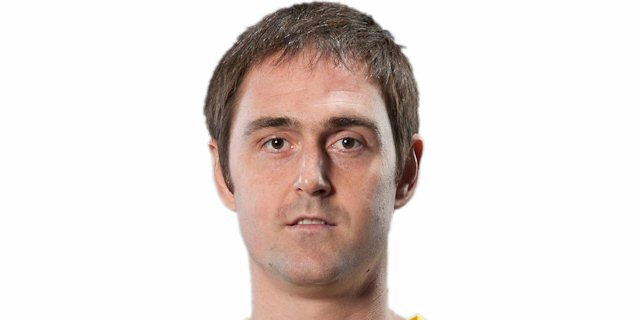 Erazem Lorbek added 11 points, while C.J. Wallacerecorded an impressive performance with 8 points, 8 rebounds, 6 assists and 3 steals. 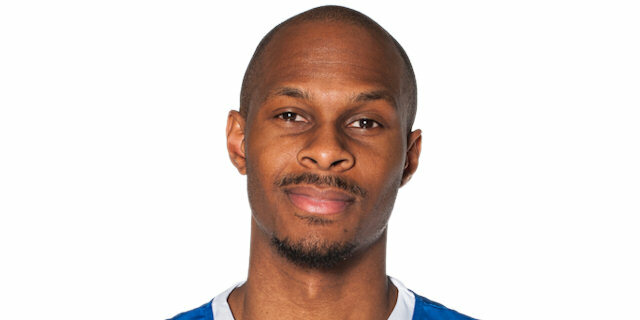 Curtis Jerrells led Besiktas with 17 points, Gasper Vidmar netted 14 and Damir Markota finished with 13 points and 8 rebounds. 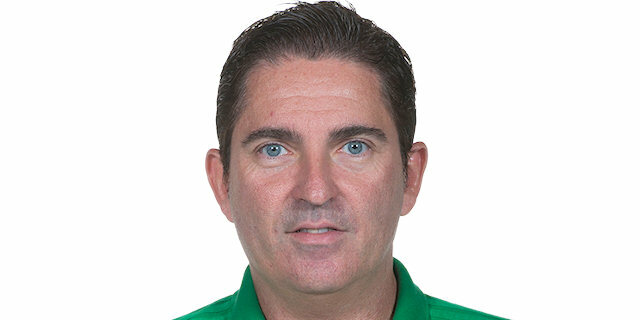 Cemal Nalga went to the bench early with his second foul, resulting in an early entrance for Vidmar, who was back after missing two games. More than two-and-a-half minutes passed before Tomic scored the game’s first basket in the paint. Soon after Vidmar scored Besiktas’s first points. Tomic remained the chief offensive weapon for the visitors and his dunk after playing a perfect pick-and-roll with Victor Sada made it 4-10. However Vidmar matched Tomic on 6 individual points with a vicious slam. Vidmar then moved ahead with an offensive rebound and two-handed jam. Pete Mickeal answered with a triple from the corner. Markota closed the gap with a jumper to beat the 24-second clock, but Sarunas Jasikevicius banked in a floater as the first-quarter buzzer sounded to make it 10-15 through 10 minutes. Vidmar threw down another dunk early in the second quarter. Jasikevicius sank a jumper before Markota completed a three-point play to make it 15-19. The hosts’ offense flowed nicely as Lorbek got to the hoop for an easy basket. After another two-handed rim-rocker, Vidmar signaled to the bench for a rest. Following a timeout, the hosts took the lead for the first time on a Markota triple from the top of the key, 22-21. Back-to-back triples by Saras and Lorbek put the visitors back on top, 24-27, midway through the quarter. Lorbek added to the Barca lead before Jerrells drained a second-chance three-pointer and then finished a fast break with a layup to even the score at 29-29. Marcelinho Huertas announced his presence for the Spanish champs with a three. Daniel Ewing brough waves of cheers with a drive to the hoops for a basket-plus-foul. Nate Jawai fell hard on the play and limped to the Barcelona bench. An open court foul committed by Cevher Ozer on Alex Abrines in the closing seconds of the half allowed the young guard to lift Barcelona to a 32-34 halftime lead. 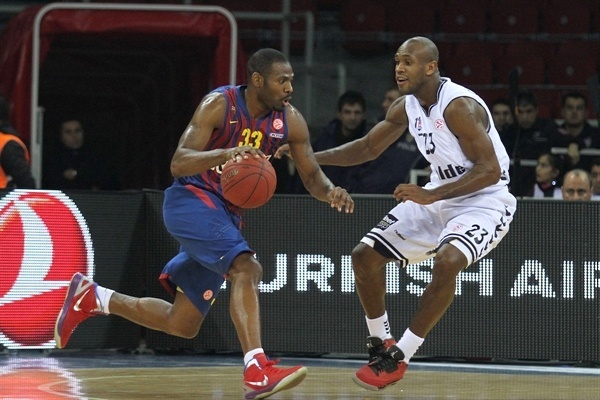 Jerrells opened the second half with a triple to put Besiktas ahead. The teams then traded the lead with the next five baskets until Jawai barreled hos way to basket that made it 39-42 midway through the quarter. Vidmar and Jawai traded baskets as the visitors maintained a slim edge. 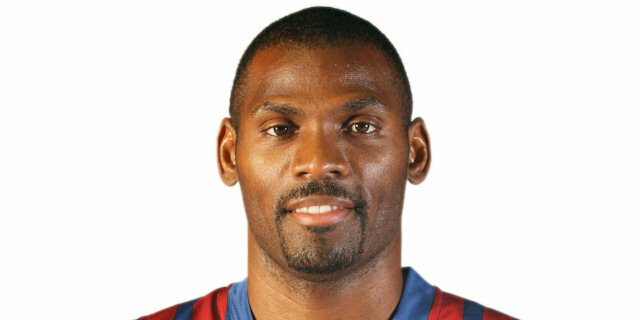 The momentum swung further Barcelona’s way when Patrick Christopher committed his third foul and a three-point-play by Mickeal, which made it 43-49. Markota answered immediately with a three. Lorbek, who drew a foul from Markota with a second left in the quarter, missed twice from the line to leave it 48-51 for the visitors with one quarter to go. Sada beat everyone down the floor for a layup in transition before Lorbek scored inside to extend the Barca lead. 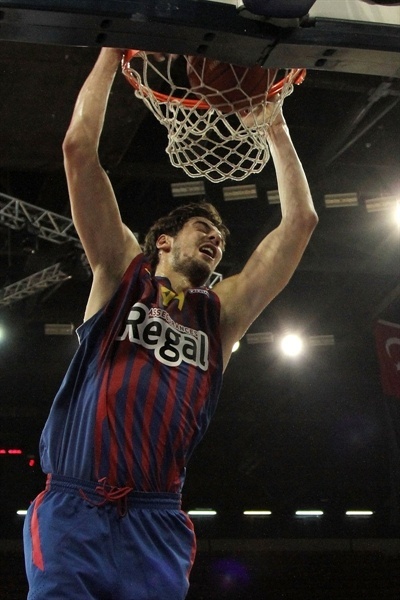 While Besiktas fell silent on offense, Tomic put the visitors up 9. C.J. Wallace made it a double-digit lead with a three from the corner. Five-and-a-half minutes without points passed before Ewing connected from behind the arc to make it 51-60. Joe Ingles and Jerrells traded threes. Barcelona’s attack cooled, but Besiktas still found it difficult to generate points. Cevher Ozer trimmed the deficit to 57-64 from the line with two minutes to go. Tomic scored again on the offensive glass and a Wallace triple with 80 seconds left essentially iced the game. "We challenged well, but only challenging is not enough to win a game. We were in the game for three quarters. But we failed to respond the same way in the last quarter. When you challenge that well, you must win the games, too. My players did everything they could do. But at the same time our opponent was Barcelona Regal and against a high level team like Barca, we needed to be much more creative to win. Anyway, we will try digging in to win the rest of the games." "Our shooting percentage around the basket was low in the beginning of the game. We were playing the pick-and-roll well, generating good driving options, but with a poor shooting percentage. In general terms, we played pretty good defense and that allowed us to win for the third time in this group. 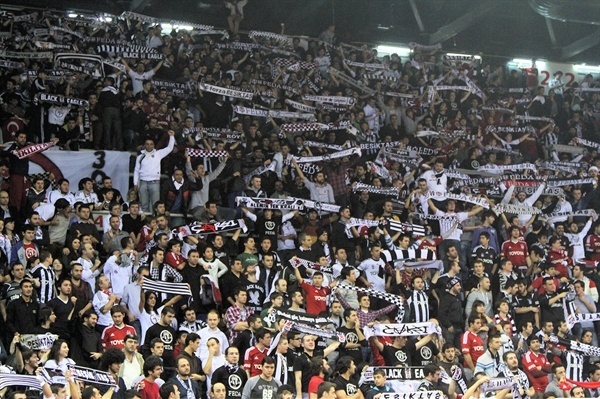 It was a similar game to the one we played against Besiktas in the regular season. We also had a low two-point percentage that night. 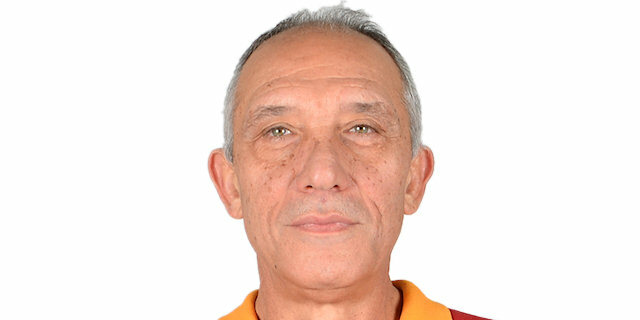 The main difference is that Besiktas did not have a good game back then and that's why the difference was bigger." "Our gameplan was to play tough for the whole the game. We did very well in the first three quarters, but everything went wrong in the last quarter. We made easy turnovers and Barcelona got the momentum. Now we have nothing to do but to get ready for the next game to win." "We played a very good game. It was a tough win. We managed to bounce back during the game. We managed to score when we needed it most and improved our defense, which was the key to winning the game." "This is a great win for us, especially after losing our last game in the Spanish League. We got the victory and now it is time to move on and start preparing the next game."